This is the eagerly awaited second volume in the new collaboration between Chandos and Imogen Cooper. In this series, she brings her virtuosity and poetic touch to the repertoire of one of the central German romantic composers. 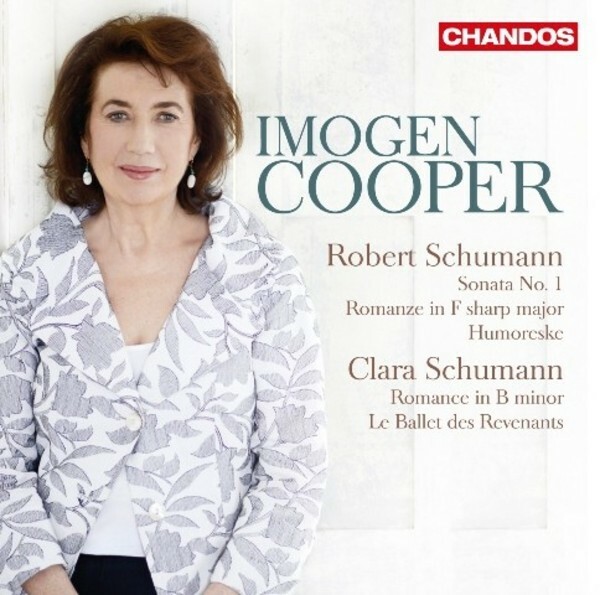 Known as a Schubert expert, she has recently turned to Schumann in an equally successful way, which she proved in her much-lauded first volume (CHAN10755). The Snape Maltings concert hall and Nicholas Marston�s detailed notes are respectively �an excellent complement� (musicwebinternational. com) and �an added bonus� (Gramophone) to the series. This album is an implicit dialog between the two Schumanns, the presence of words sensed at every point: from the Lied-like melody in the love duet that is Robert�s �Romanze� to the Humoreske, an imaginary song inspired by Clara. Even the Sonata was dedicated to Clara, �by Eusebius and Florestan� who represent the dual poetic sides of Schumann�s nature. This imaginary world was the frame for Clara�s �Sc�ne fantastique� � renamed �Doppelg�nger Chorus� in the long, yet often passionately hopeless, correspondence which Clara and Robert carried on during their courtship.